Many different types of weeds can invade your St. Augustine grass lawn, and identifying the specific weed is crucial to getting rid of it. Some weeds are considered broadleaf weeds, while others are types of grasses, all of which have different effective controls. When your St. Augustine grass is dormant, cool-season weeds, like henbit and chickweed, can invade it easily. You may also see grassy annual weeds in your lawn, such as annual bluegrass and crabgrass, as well as perennial grass weeds like dallisgrass. Identify henbit in your St. Augustine grass by looking for weeds that bloom in pinkish-purple tiny flowers in early spring. Henbit reaches heights of less than 1 foot and has square stems. 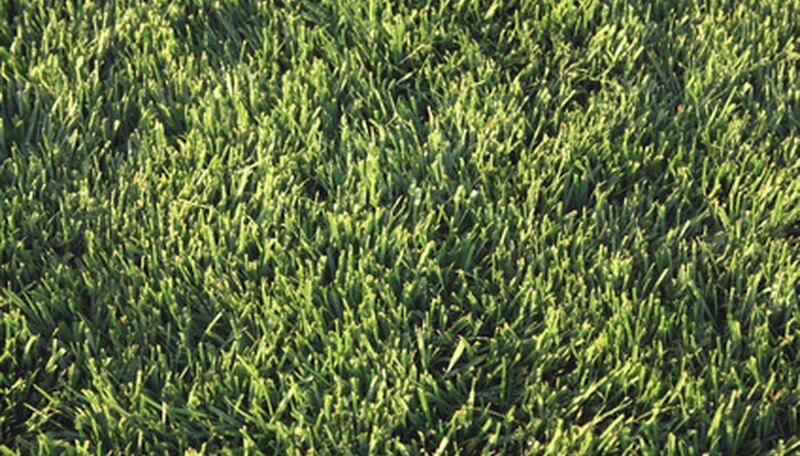 Spot chickweed growing in your St. Augustine grass lawn in the cool, wet spring months. Chickweed has slender, branched stems and smooth, oval leaves with clusters of flowers. Chickweeds form a thick mat in early spring. Look for a spreading grass weed in summer that has branched stems and less than 2-inch-long leaf blades to identify crabgrass. Crabgrass has dense hairs on the leaf sheaths and sprouts “spikelet” leaves in groups of two to nine from a single stem. Identify annual bluegrass invading your St. Augustine grass lawn by the grass weed’s smooth leaf blades that have boat-shaped tips. Annual bluegrass emerges in tufts and clumps during winter, sprouting light-green or whitish spikelets on the stems and dense flower clusters. Study your St. Augustine grass for clumping perennial weeds that have rough, hairy leaf sheath bases to identify dallisgrass. Dallisgrass has three to seven alternate stem branches that sprout spikelets in four rows. Control henbit, chickweed and other cool-season weeds with a hormone-based herbicide in early spring. Treat grassy weeds with non-selective or selective herbicides, but beware that perennial weed grasses like dallisgrass are tough to control. Don't apply a chemical weed control to your St. Augustine grass lawn before you've properly identified the weed species. Spray only the weeds and not your St. Augustine grass when you're using a non-selective herbicide, because these herbicides will kill your lawn grass along with the weeds.